We live up in the mountains where mornings and evenings get very cold. 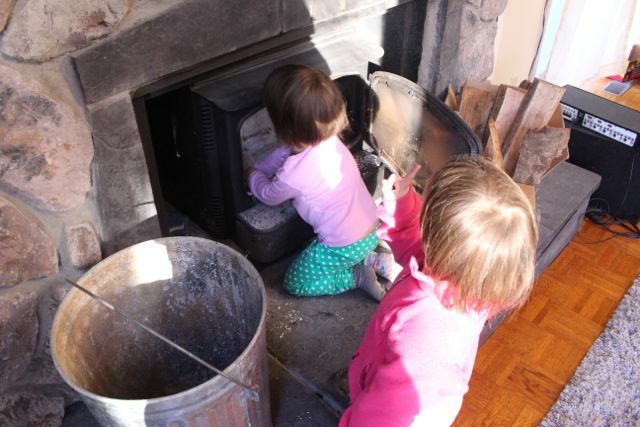 Whenever we start a fire, B and M are there to help us. 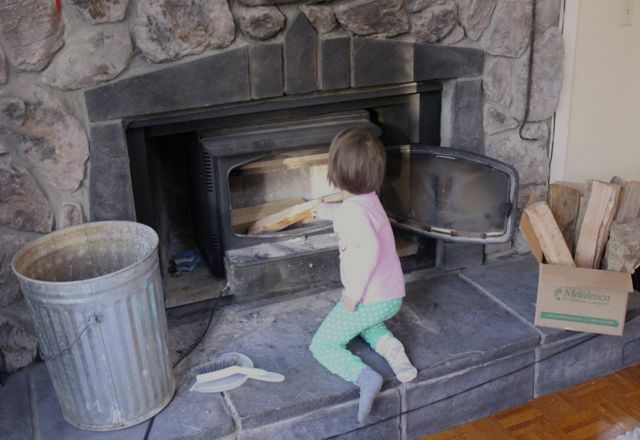 M (3 years 1 month) has experienced the process so many times, she can pretty much do the whole thing by herself, as long as an adult is there to help her light the fire. and dumps it out in the trashcan. …gets a big scoopful, then dumps it in the trash. After several trips, the fireplace is now clean and ready for new firewood. …and some smaller pieces at top. 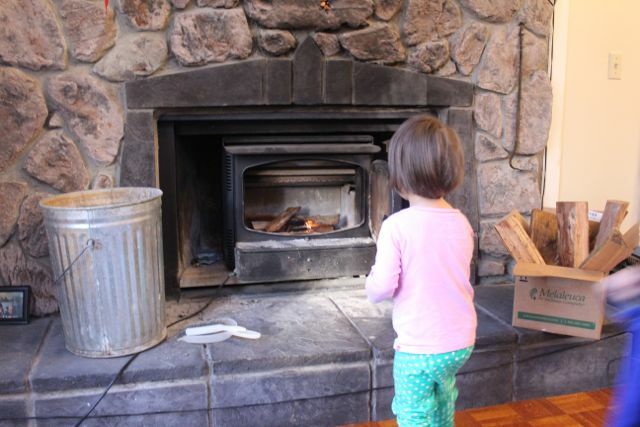 She gets the fire starter. Then she gets the torch. Don’t worry, dear readers – Mom’s the one who lights it! Now we have a warm fire to enjoy the rest of the day! Look around your home and see if there is a task your family does everyday that your child could participate in – and maybe take over. Let them have the choice of doing the activity everyday, but a child under 5 is too young to be required to do it everyday. 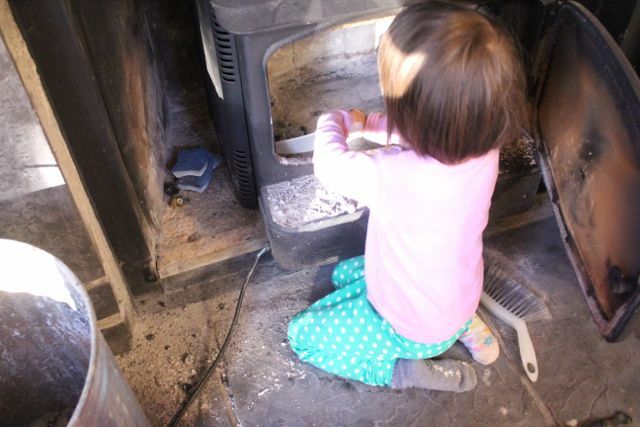 When your child starts to help out around the house, don’t feel like you need to reward them or praise them excessively. 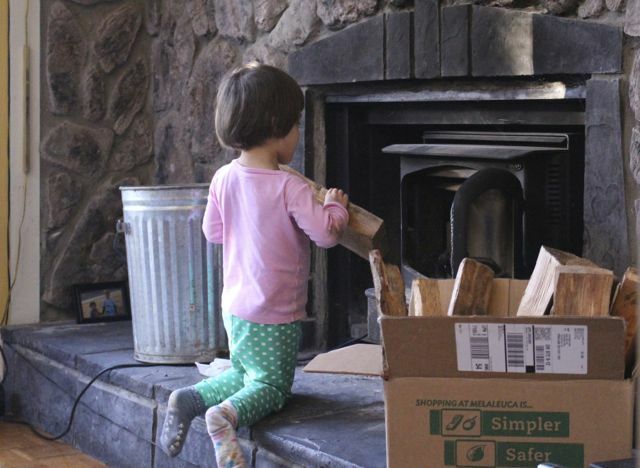 If you rely heavily on qualitative praise (like, ‘you’re so smart’) or giving your child rewards (like toys, money or cookies) – it will take away from their own sense of accomplishment. Pretty soon, you’ll find that they only do things for your praise or reward. And their joy of doing the activity diminishes. 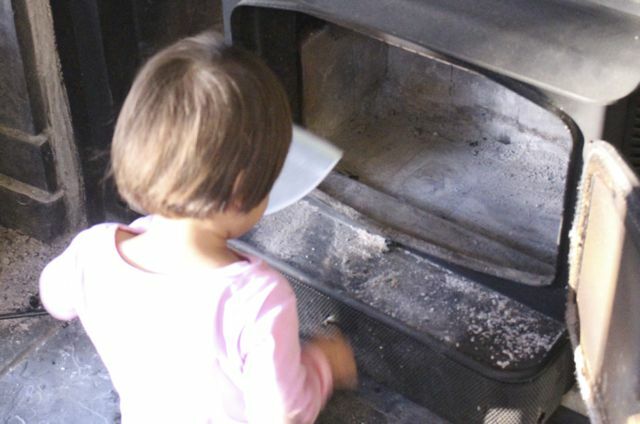 The best way to praise your child is by using simple phrases like, ‘You cleaned the fireplace,’ ‘You helped wash the dishes’ or ‘You brought your dishes to the sink.’ These descriptive praises tells them you noticed what they did – and your acknowledgement is all they need. So much has happened recently, sometimes I don’t know where to begin to share with you all! So I thought I’d give you a brief overview of what we’ve been up to, including our plans for the summer and fall. My husband and I are in the final stretch of our training (I’m doing my Primary training 3-6 and he is doing Elementary training 6-12). We will both be student teachers for the next month at one of the best Montessori schools in Portland and then it will be exam time! There is only one word for these AMI Montessori trainings: INTENSE. And to do it with twin 3-year-olds while consulting clients on evenings and weekends…well, it hasn’t been easy. However, it has forced me to do a lot of soul-searching and transformation to become someone who can handle all of this stress! So in that sense, it’s been a great experience. This summer, we will be going back to Taiwan. B and M will be attending summer school at Taipei Montessori School. I am sooo excited about this. The program looks AMAZING. I’m not just saying this because I have family ties with that school. Seriously, I’ve looked into so many summer schools these last two years and this one has the best program I’ve seen. Summer school starts on June 16th. It runs from 830-4pm Monday through Friday. There is the Montessori work cycle in the morning, followed by extracurricular activites everyday, like Taekwondo, Taiko drumming, mosaic art, cooking, music, gymnastics etc. 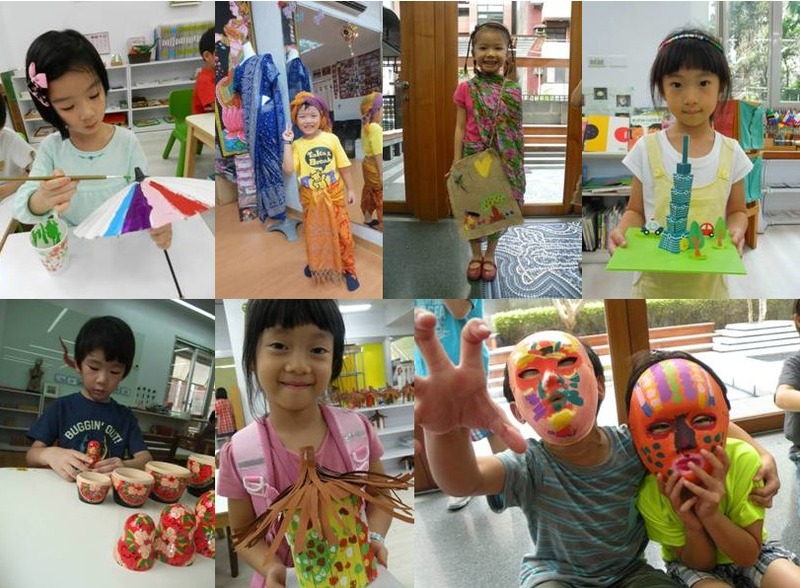 Afternoons are all cultural extension activities, which means, they explore Taiwanese, Aborigine and the larger Asian cultures through art, music, books, plays and other hands-on, sensorial activities. There will also be outings, including swimming, once a week. I’m so excited for B and M to finally get fully immersed in a Chinese-speaking environment! I hope some of you will come and spend the summer with us in Taipei. Even if your child doesn’t speak any Chinese, they will learn so quickly. That is the power of the young child’s Absorbent Mind when it comes to language. There are lots of Caucasian children who attend this school and it always shocks me to hear perfect Chinese come out of them! For more information, click here for English and here for Chinese. Next fall, we will be moving to the Bay Area in California, where we will be starting a Montessori Chinese Immersion school. We don’t have the official name yet, or the exact location, but the details are in the works! It will be a Primary program accepting children between 2.5 – 6 years old. Our anticipated opening date is Jan of 2015. I hope some of you who live out there will come by to check us out! Parents ask me about discipline more than any other questions. What do I do if my child hits, screams, cries or throws tantrums? When I address this question straight on, I can offer parents band-aid solutions. We all need something to fix the problem now. However, what I’m really interested in is working with parents to find permanent solutions. Bad behavior is never what it seems – there is always a root cause hidden underneath. Dr. Montessori’s own story provides a clue to the conundrum of bad behavior. An Italian physician, who worked with special needs children in psychiatric hospitals, Dr. Montessori became a sensation when her students passed the regular state exams, many of them with flying colors. She questioned how her methods would work with regular children. When a new housing project for migrant workers went up in Rome, the officials couldn’t figure out what to do with the children while their parents were at work. 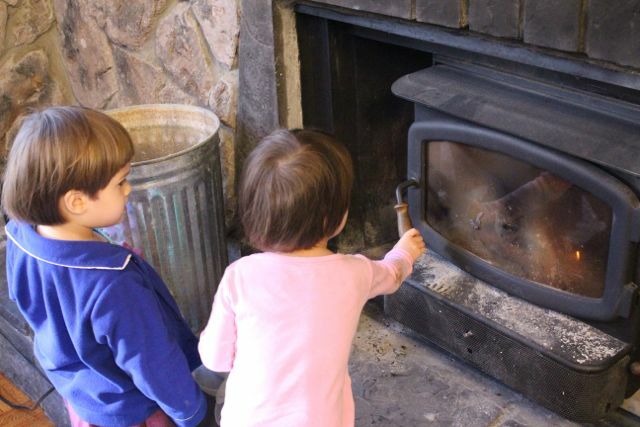 This is how Dr. Montessori came to be entrusted with 40 3-6 year olds children. Her methods produced miraculous results. In one year, aristocrats, scholars, teachers and parents around the world started visiting her school at the news of 4-year-olds spontaneously writing. And not just that. The dirty, sullen, timid children of poor, illiterate workers had become polite, self-disciplined, graceful and independent little human beings. 1. Help them do it by themselves. Mackenzie has to constantly remind me with her little shrieks, “BY MYSELF!” That little shriek (and sometimes full-blown crying) is an act of self-preservation. She needs to learn to do things by herself and become independent. The survival of the human race has depended on our drive for self-sufficiency. If I’ve undone the button for her, opened the door for her or poured the milk for her, I’ll just go back two steps and button the button, or close the door or pour the milk back – and let her do it. That is not spoiling or giving in to her, that is giving her the help she really needs. Do you ever just pick up your child without asking? Do you ever just do things for them because you’re on automatic – serving them dinner, cleaning up after them, putting on their clothes? Yes, it’s automatic for us parents, but if you’ve got a tantruming child, see if you’ve just intruded on their independence and made them into babies. If there is anything they hate, it’s being a baby all over again. 2. 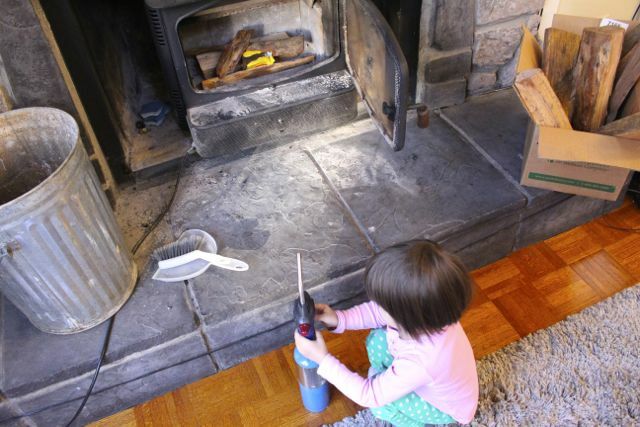 Give your children plenty of opportunity to work with their hands. Play kitchens are fine, but pretend cooking with a plastic skillet will never require the kind of hand-eye coordination, care and attention that real pancakes on a skillet would require. 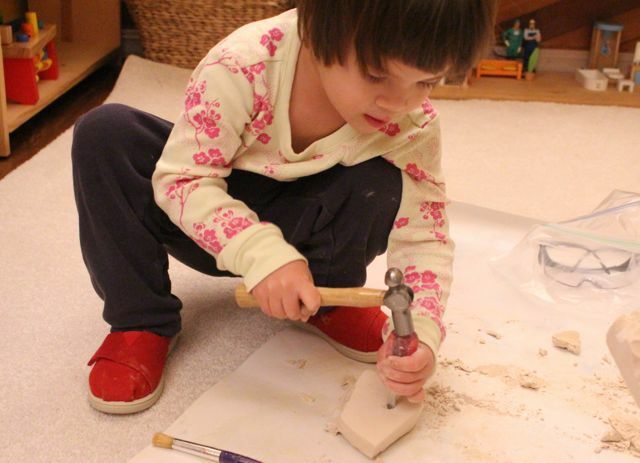 Dolls and cars are great, but activities like hammering a nail, sewing with a needle, cutting with scissors are even better for their developing hand and intellect. And your child thrives on perfecting his coordination and abilities. Provided everything is child-sized, those kinds of activities make them happy, independent and trusted. 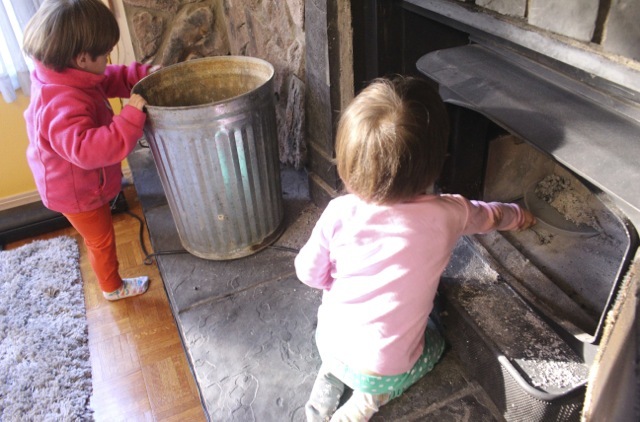 Expect them to become fully absorbed and do things you never imagined young children doing. 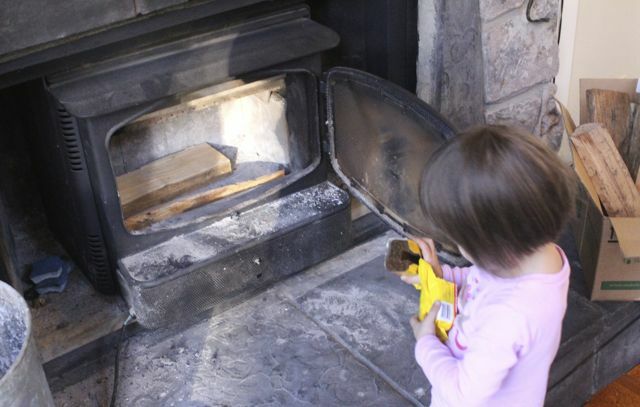 A child at 18 months and over can start using many kinds of kitchen utensils. B and M used their first pair of scissors at 19 months, cut with knives at 20 months and made scrambled egg here at 22 months. Watch what this Montessori mom does with her little one. 3. 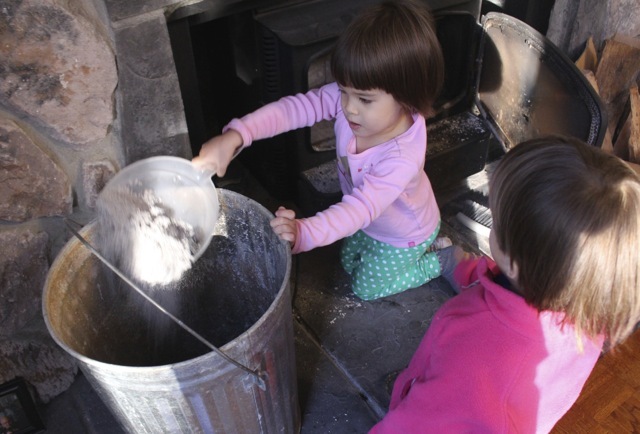 Children will do best when activities build on the skills of previous activities. Instructional scaffolding improves learning. If your child has never poured water before, don’t put them in front of a hot skillet to pour eggs. To learn pouring, a young toddler can start with stacking cups in the tub, then given a pitcher and glass at meals to pour his own milk. You can then teach her to pour through a funnel before letting her pour faster, runnier things like eggs. Let your child peel first bananas, then mandarins, then eggs. Let your child help mix things – first something liquid, then something heavier like batter before moving on to salads and spaghetti. Yes, the kitchen is a great place to build skills! If your child is throwing a tantrum, screaming, hitting, yelling, calling you names, you need to address the behavior. You’re more than likely to encounter resistance though. But a child who is concentrating on doing something with his hands and absorbed in that activity isn’t interested in throwing a tantrum. He’s too busy. And usually, you’ll find that when he comes out of a period of concentration, he’s happier, lighter and more ready to do what you ask. I’ll leave you with one final thought: young children need lots of collaboration. If they don’t want to do something in the moment (even though they did it so well yesterday), their brains are not developed enough to have the kind of consistency you want and expect from adults. Today, they may just need a little more help. But not too much help – just enough till they can take over.